Greetings! My favorite vacation spot is Disney World. My husband and I have been there many, many different times. One of my favorite rides is Peter Pan's Flight. I don't get to ride it nearly as much as I'd like because the wait times are typically insane for it! 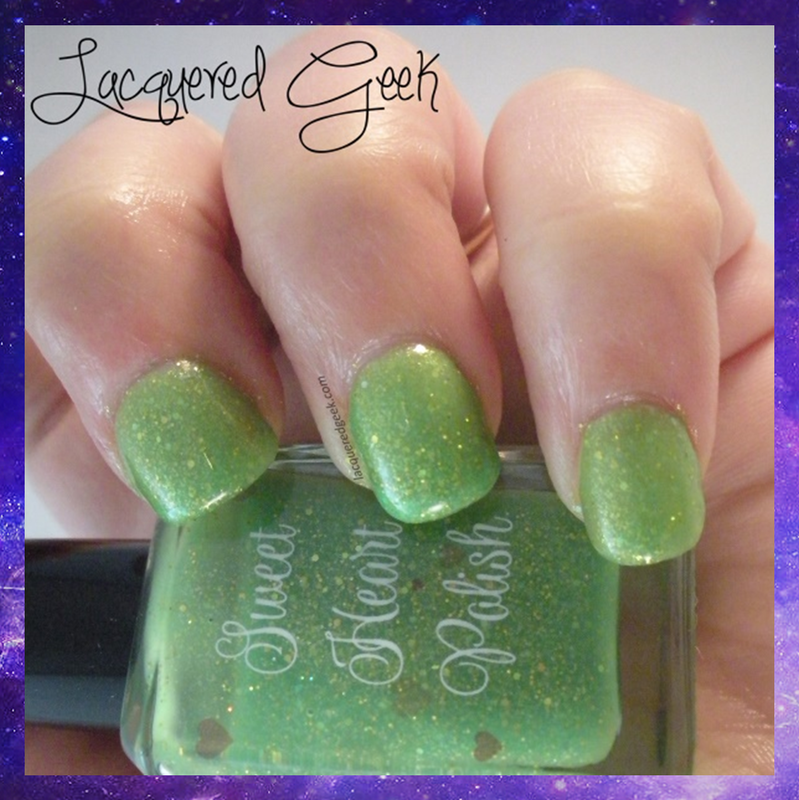 My love of this ride was what initially drew me to The Ladies of Peter Pan, the collaboration duo from Sweet Heart Polish and Blue-Eyed Girl Lacquer. In this adorable box, you get "Sewing Shadows" from Blue-Eyed Girl Lacquer, "Oh look, a firefly!" 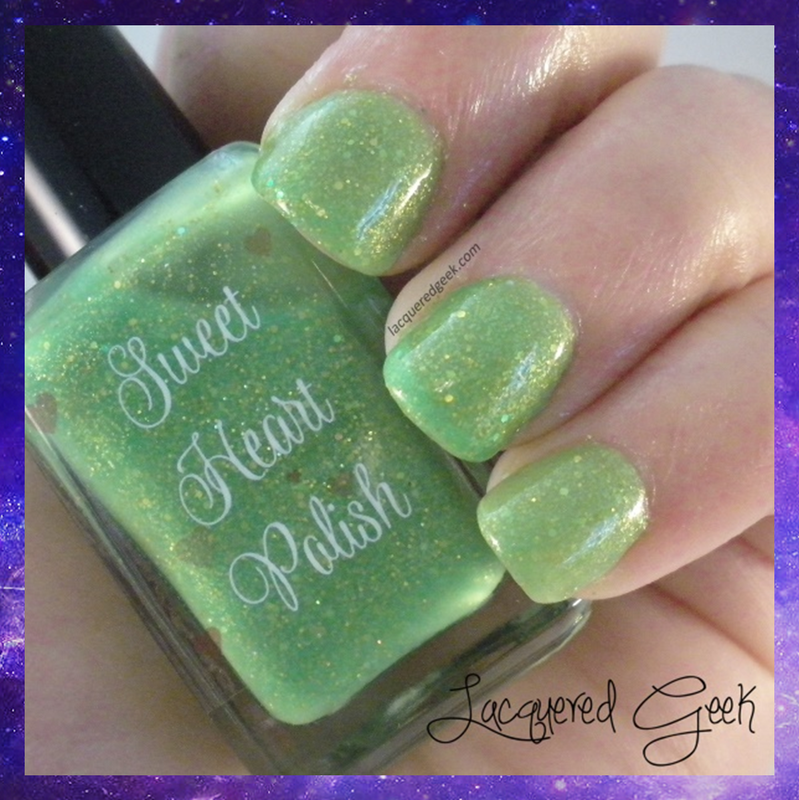 from Sweet Heart Polish, Wendy Darling & Tinker Bell vinyls from Monster Polish, a vial of pixie dust, and a cute little pin featuring the ladies of Peter Pan! 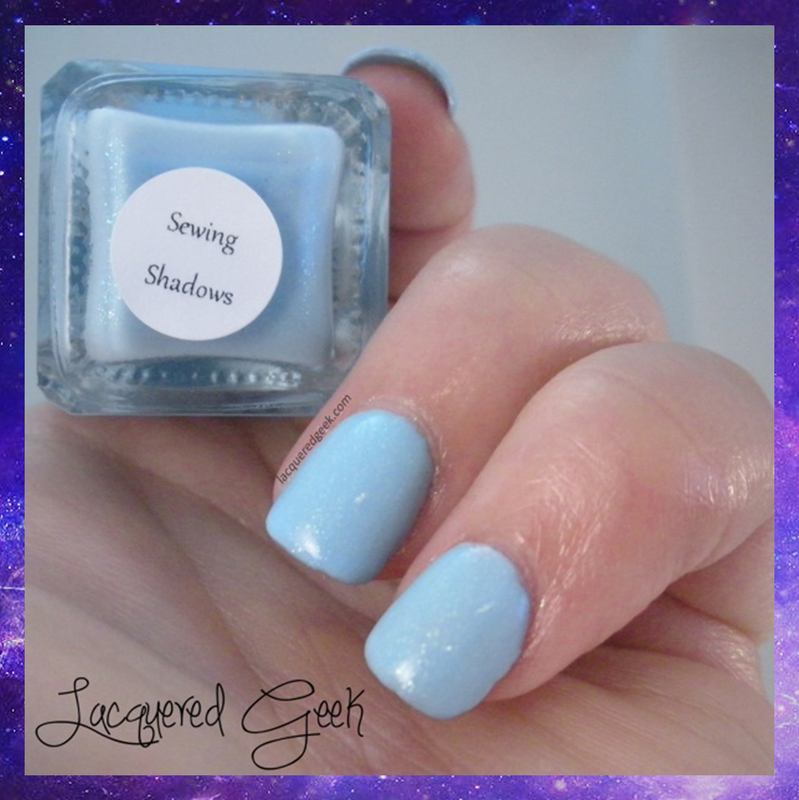 Inspired by Wendy's nightgown, Sewing Shadows is a beautiful baby blue polish with green shimmery glass flecks. 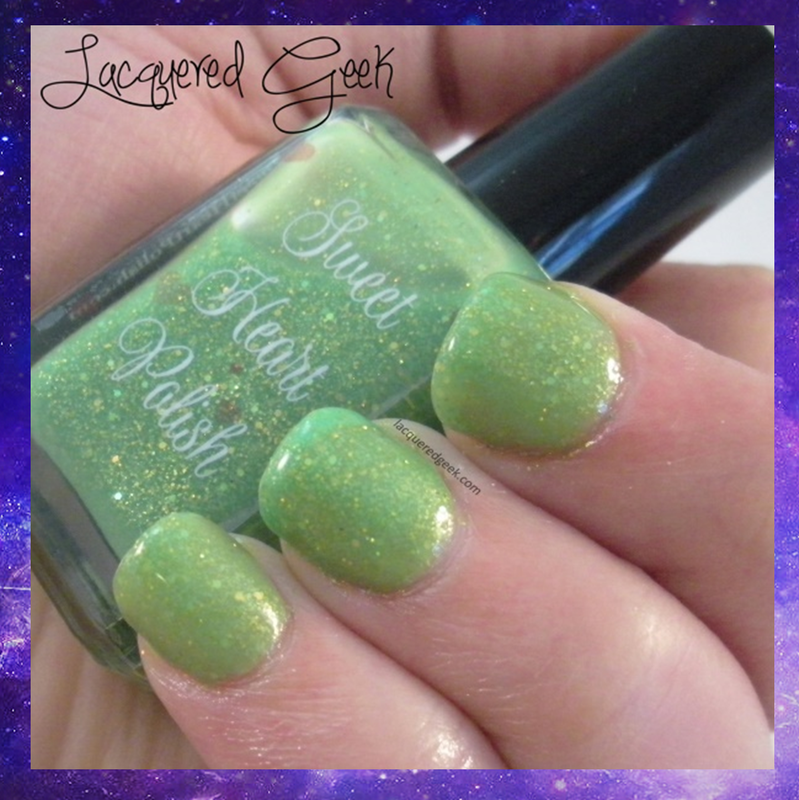 The shimmer really adds so much depth to this polish! 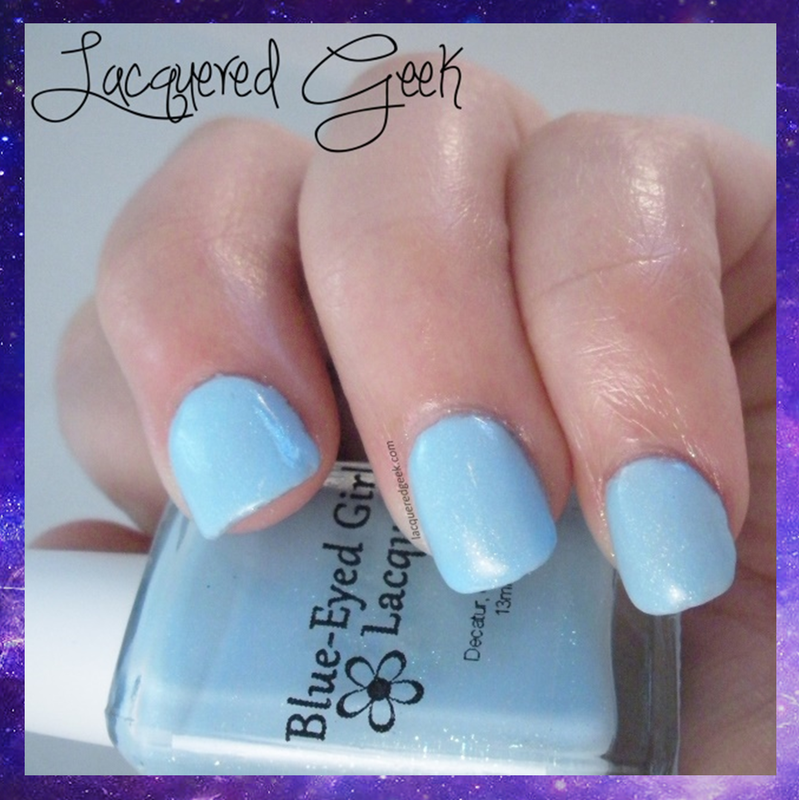 The formula is consistent with other Blue-Eyed Girl Lacquer polishes; a little on the thick side so you may want to add thinner. I used 3 coats and a top coat for these photos. The other polish in this box is Oh look, a firefly! from Sweet Heart Polish. It is based on the feisty fairy, Tinker Bell, and is described as a "lime green jelly packed with chartreuse and gold holographic and metallic glitters." It is extremely sheer. I used 4 coats for these photos, which is my limit, and I still have a visible nail line. I prefer to see polishes build to opacity rather than layered over undies (unless they are a glitter topper) because I like to see the true depth of the polish. However, the next time I wear this one, it'll be over another polish. 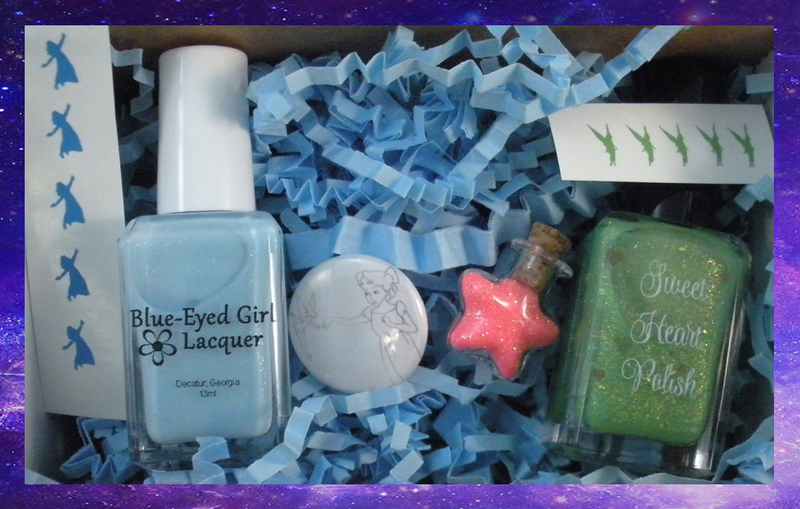 The Ladies of Peter Pan duo box is $25.00, and can be purchased from either Blue-Eyed Girl Lacquer or Sweet Heart Polish. Fast pass is the only way I get to ride it as well! October used to be a great time to visit with hardly any wait times, even at Magic Kingdom (plus the benefit of the Food & Wine Festival) but not so much anymore. We're getting ready to start planning our next trip soon! I'm so glad that I helped you decide on this terrific duo! 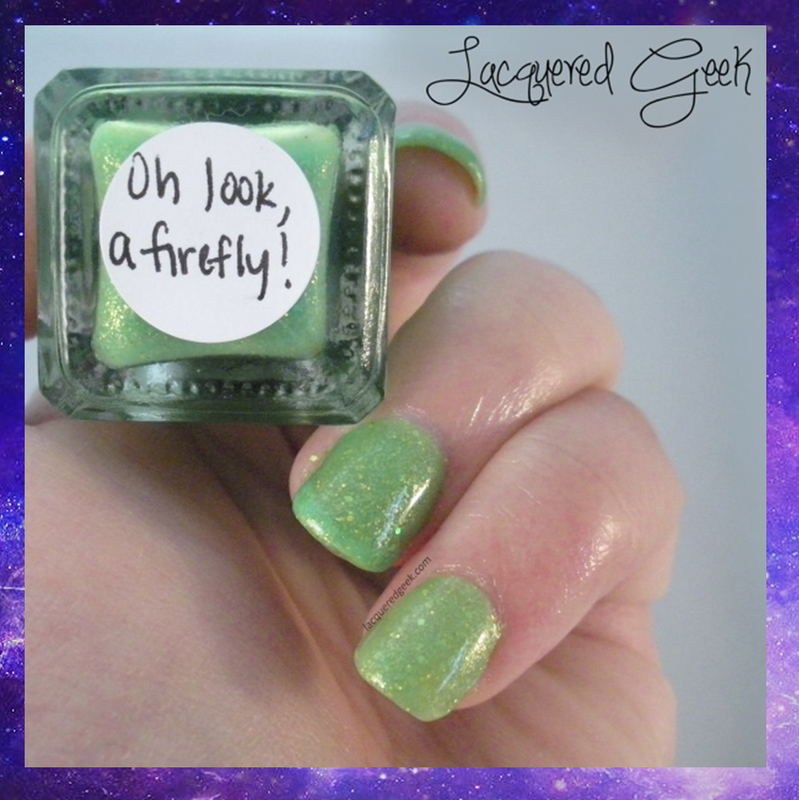 Firefly is truly gorgeous, and perfectly Tink!